The author of the 400,000-copy bestseller On Killing reveals how violent video games have ushered in a new era of mass homicide--and what we must do about it. Paducah, Kentucky, 1997: a 14-year-old boy shoots eight students in a prayer circle at his school. Littleton, Colorado, 1999: two high school seniors kill a teacher, twelve other students, and then themselves. Utoya, Norway, 2011: a political extremist shoots and kills sixty-nine participants in a youth summer camp. Newtown, Connecticut, 2012: a troubled 20-year-old man kills 20 children and six adults at the elementary school he once attended. What links these and other horrific acts of mass murder? A young person's obsession with video games that teach to kill. Lt. Col. Dave Grossman, who in his perennial bestseller On Killingrevealed that most of us are not 'natural born killers' - and who has spent decades training soldiers, police, and others who keep us secure to overcome the intrinsic human resistance to harming others and to use firearms responsibly when necessary - turns a laser focus on the threat posed to our society by violent video games. 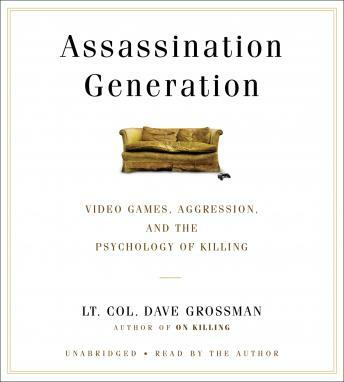 Drawing on crime statistics, cutting-edge social research, and scientific studies of the teenage brain, Col. Grossman shows how video games that depict antisocial, misanthropic, casually savage behavior can warp the mind - with potentially deadly results. His audiobook will become the focus of a new national conversation about video games and the epidemic of mass murders that they have unleashed.